Mayson Service Center up and running! After installing the first Mayson Service Center for the Benelux area in july, Ruurd Boerma of distributor Bas van den Broek bv, visited the Mayson workshop in Huadu, China. 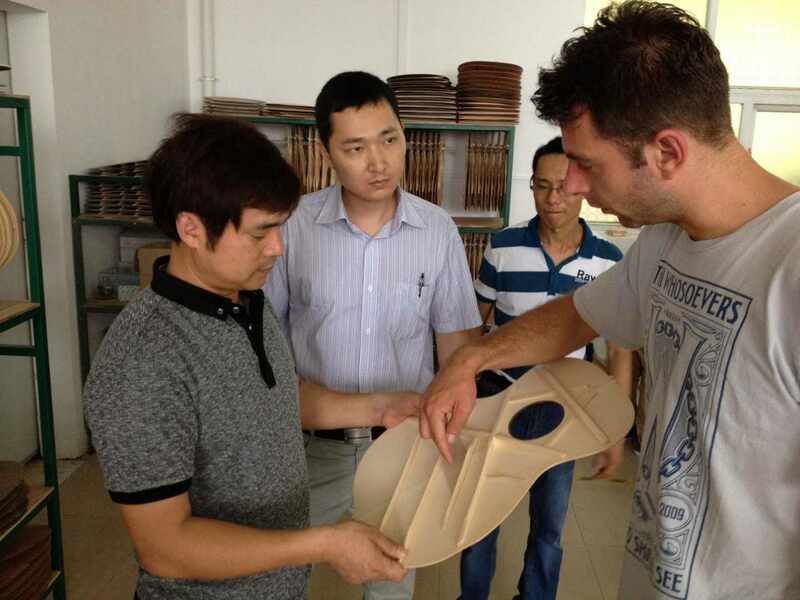 Head designer and company owner Alex Wang proudly showed Ruurd the latest technical developments for the next generation of Mayson guitars. The progression made include highest grade German made fretwork, a new computer controlled neck mounting procedure, UV lacquer on all models and new Mayson Purecoustics™ electronics available from model M1 up. To assure Mayson’s high quality standards, after arriving in Europe, each guitar is re-inspected and set-up in the Mayson Service Center. Furthermore, MSC will handle all necessary after sales technical care and offer fast and accurate repairs on Mayson instruments. From left to right: CEO Alex Wang, PRC Marketing & Sales Executive Ethan Cui and Ruurd Boerma.